There are also some paid workshops that take all day with topics such as “Android (NDK) and ARM overview”, “ARM and the Internet of Things”, or “ARM Accredited Engineer Programs”. In this session, Dr. Saied Tehrani will discuss how Spansion’s approach to utilize the ARM Cortex-R line of processors to deliver energy efficient solutions for the automotive MCU market has led the company to become a vital part of the movement toward connectivity in cars. Beginning with an overview of the auto industry’s innovation and growth in connected car features, he will explain how these systems require high performance processing to give drivers the fluid experience they expect. Highlights in security and reliability with ARM Cortex-R, including Spansion’s Traveo Family of MCU’s will also be presented. ARM’s Cortex-M family of embedded processors are delivering energy-efficient, highly responsive solutions in a wide variety of application areas right from the lowest-power, general-purpose microcontrollers to specialised devices in advanced SoC designs. This talk will examine how ARM plans to grow the ARM Cortex-M processor family to provide high performance together with flexible memory systems, whilst still maintaining the low-power, low-latency characteristics of ARM’s architecture v7M. Amongst ARM’s IP portfolio we have CPUs, GPUs, video engines and display processors, together with fabric interconnect and POP IP, all co-designed, co-verified and co-optimized to produce energy-efficient implementations. In this talk, we will present some of the innovations ARM has introduced to reduce memory bandwidth and system power, both in the IP blocks themselves and the interactions between them, and how this strategy now extends to the new ARM Mali display processors. Designing a system that has to run on coin cells? There’s little accurate information available about how these batteries behave in systems that spend most of their time sleeping. This class will give design guidance on the batteries, plus examine the many other places power leakages occur, and offer some mitigation strategies. Demonstration of the Android Open Source Project for ARMv8 running on Juno. Statistics is often perceived as scary and dull… but not when you apply it to optimizing your code! You can learn so much about your system and your application by using relatively simple techniques that there’s no excuse not to know them.This presentation will use no slides but will step through a fun and engaging demo of progressively optimizing OpenCL applications on a ARM-powered Chromebook using IPython. Highlights will include analyzing performance counters using radar diagrams, reducing performance variability by optimizing for caches and predicting which program transformations will make a real difference before actually implementing them. The proliferation of mobile devices has led to the need of squeezing every last micro-amp-hour out of batteries. Minimizing the energy profile of a micro-controller is not always straight forward. A combination of sleep modes, peripheral control and other techniques can be used to maximize battery life. In this session, strategies for optimizing micro-controller energy profiles will be examined which will extend battery life while maintaining the integrity of the system. The techniques will be demonstrated on an ARM Cortex-M processor, and include a combination of power modes, software architecture design techniques and various tips and tricks that reduce the energy profile. One of the obstacles to IoT market growth is guaranteeing interoperability between devices and services . Today, most solutions address applications requirements for specific verticals in isolation from others. Overcoming this shortcoming requires adoption of open standards for data communication, security and device management. Economics, scalability and usability demand a platform that can be used across multiple applications and verticals. This talk covers some of the key standards like constrained application protocol (CoAP), OMA Lightweight M2M and 6LoWPAN. The key features of these standards like Caching Proxy, Eventing, Grouping, Security and Web Resource Model for creating efficient, secure, and open standards based IoT systems will also be discussed. Virtual Prototypes are gaining widespread acceptance as a strategy for developing and debugging software removing the dependence on the availability of hardware. In this session we will explore how a virtual prototype can be used productively for software debug. We will explain the interfaces that exist for debugging and tracing activity in the virtual prototype, how these are used to attach debug and analysis tools and how these differ from (and improve upon) equivalent hardware capabilities. We will look in depth at strategies for debug and trace and how to leverage the advantages that the virtual environment offers. The presentation will further explore how the virtual prototype connects to hardware simulators to provide cross-domain (hardware and software) debug. The techniques will be illustrated through case studies garnered from experiences working with partners on projects over the last few years. Connecting debuggers and other analysis tools. Strategies for productive debug of software in a virtual prototype. How to setup trace on a virtual platform, and analysing the results. Hardware in the loop: cross domain debug. Use of Python to control the simulation and trace interfaces for a virtual platform. 14:30 – 15:20 – GPGPU on ARM Systems by Michael Anderson, Chief Scientist, The PTR Group, Inc. ARM platforms are increasingly coupled with high-performance Graphics Processor Units (GPUs). However the GPU can do more than just render graphics, Today’s GPUs are highly-integrated multi-core processors in their own right and are capable of much more than updating the display. In this session, we will discuss the rationale for harnessing GPUs as compute engines and their implementations. We’ll examine Nvidia’s CUDA, OpenCL and RenderScript as a means to incorporate high-performance computing into low power draw platforms. This session will include some demonstrations of various applications that can leverage the general-purpose GPU compute approach. That’s 14 sessions out of the 75 available, and you can make your own schedule depending on your interests with the schedule builder. 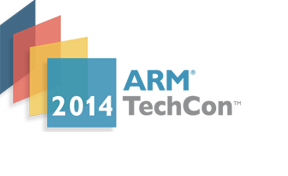 In order to attend ARM TechCon 2014, you can register online, although you could always show up and pay the regular on-site, but it will cost you, or your company, extra. There are more types of pass this year, but the 2-day and 1-day pass have gone out of the window. The expo pass used to be free at any time, but this year, you need to register before August 8. VIP and All-access provides access to all events, General Admission excludes AAE workshops and software developer workshops, AAE Training and Software Developers Workshop passes give access to the expo plus specific workshops. Further discounts are available for groups, up to 30% discount.